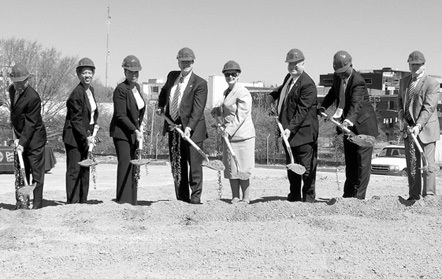 On March 31, 2010, ground was broken for the new Durham County Courthouse. The LEED (Leadership in Energy and Environmental Design) gold-certified facility opened three years later in February 2013. The courthouse features 20 courtrooms and secure access to the jail. It houses the offices of the sheriff, clerk of courts, district and superior courts, public defender, district attorney, and trial court administration. It, along with the Durham County Detention Center and parking facilities, make up the Durham County Justice Center. Pictured here turning the soil are Public Defender Lawrence Campbell, Chief District Court Judge Elaine Bushfan, District Attorney Tracey Cline, Court of Appeals Chief Judge John Martin, Supreme Court Chief Justice Sarah Parker, Clerk of Court Archie L. Smith III, Senior Resident Superior Court Judge Orlando Hudson, and Resident Superior Court Judge James Hardin.